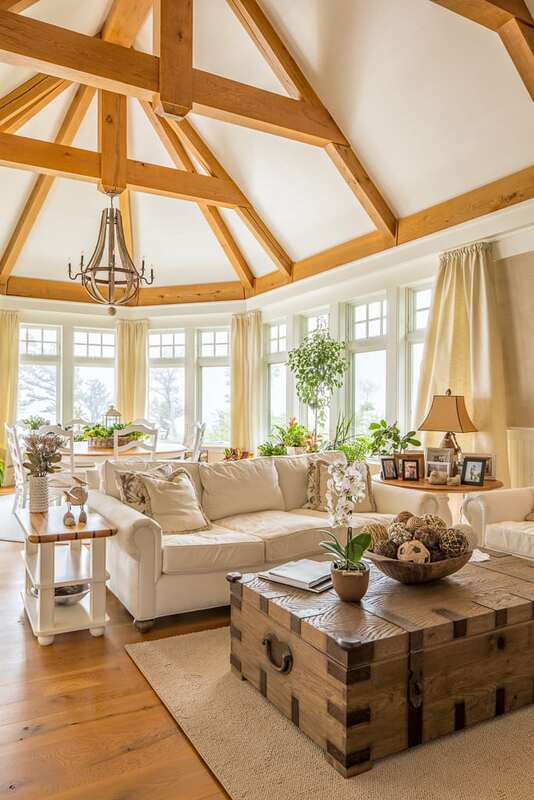 Located on Southern Maine’s coast, this Cape Neddick home features gorgeous exposed beams, oak-paneled barrel ceilings, and luxuriously layered linens amongst the light filled living space. The New Hampshire couple opted against the typical post-retirement downsize and instead chose to expand and renovate this masterpiece so they could regularly accommodate hosting friends and family. Guests are welcomed into the home with spectacular ocean front views from nearly every room. As originally featured in Maine Home and Design this home was designed using Carlisle’s random width White Oak flooring which was site finished with tung oil. Many people fall in love with this floor for its natural nutty brown hues and dramatic grain patterns. Each board boasts grain from simple and sleek to more intricate swirls, giving depth and character which brings life to any room. White Oak is also favored for its durability among the hardwoods and its adaptability to take on a wide range of stains and finishes. When the random widths are installed as these homeowners did, the look and feel can be more authentic or reminiscent of original wide plank floors. So what does it take to build a masterpiece like this home? An amazing team of true professionals always helps when it’s time to bring a vision to life. The Erikson’s partnered with Paul Gosselin and Rob Freedman of Salmon Falls Architecture and Tim Spang of Spang Builders to strip the home down to its original studs and renovate from scratch. They then worked with interior designer, Lisa Teague, to carefully curate the color tone and layered accents throughout the home. Ryan Thompson Masonry custom designed the fieldstone fireplaces and the couple custom designed more than a dozen wood furnishings which later evolved into their Portsmouth-based furniture line, Eport. Whether you’re beginning a full scale remodel or new build, or simply looking to update your interior, you can use these simple steps to get started on creating the home you’ve always dreamed of. Create a space that reflects your lifestyle. If you’re an adventure-seeker that might mean a home located in the foothills of the Rocky Mountains with unobstructed views of the surrounding landscape. Nature lovers caught in the cityscapes might opt for a NanaWall bifold door to create a seamless transition and bring the great outdoors in. These homeowners created an expansive masterpiece on their rolling five acre Cape Neddick home fit to host 100 person multi-generation get-togethers. Sharing their space, entertaining guests, and making them feel welcomed required the proper space to do so. Start with the top three or five items that are most important to you. This home boasts dramatic ocean views, barrel oak ceilings, a “man cave”, a private spa bath, and room to easily host large get-togethers. When the list of wants becomes overwhelming, take a step back and start with a handful of items to help you get started and prioritize your design before worrying about the details. This home salvaged some of the original material after stripping the walls down to the bare studs. 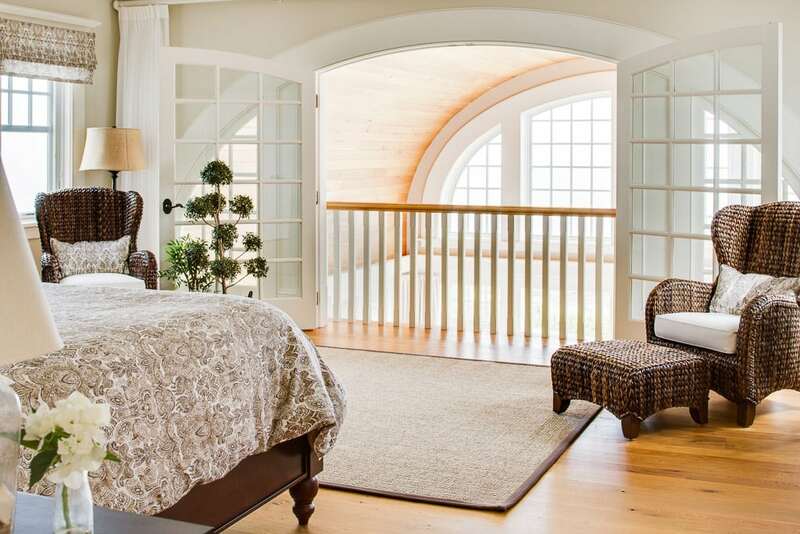 The original central gable was preserved and what was once an attached garage is now the guestroom and entryway. The home was further accented with natural timbers, such as the exposed oak beams of the kitchen or the barrel oak ceilings of the sunroom, which gave the space character reminiscent of an old time cottage. Just like your perfectly curated fall attire, layers create texture, dimension and contrast that are visually appealing to the eye. Layering also creates a warmer, more inviting space you’ll be happy to call home. Layers don’t have to end with fabrics either. Make sure you layer your lighting using a combination of natural, overhead, and decorative lights to make rooms appear bigger and accent the right elements of your design. Set the look and feel for your space from the get go. Front doors and entry ways will define the tone that follows so take care to make a strong first impression. 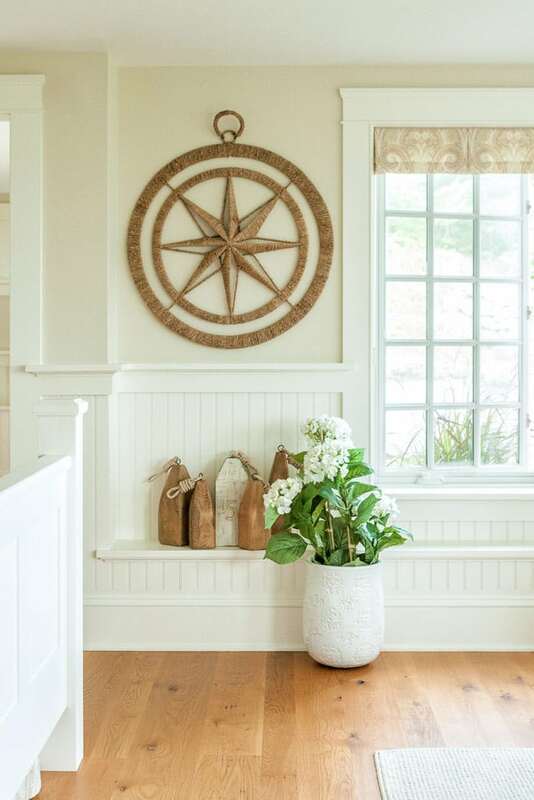 Whether its guests walking through the door for the very first time, or your daily retreat into the space of your home after a long day, you’ll want your entry space to welcome all who cross the threshold into your home.